Dr. Norman Cornett was recently interviewed by RadioVM about his experience translating Farida by Naïm Kattan. In the interview, Norman discusses the significance of Naïm Kattan in general, and his work Farida in particular. 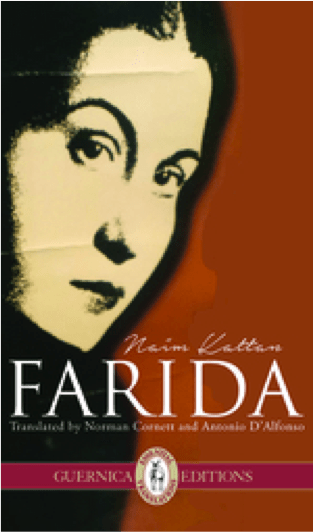 Farida tells the story of a Jewish woman and cabaret singer struggling for survival in pre-World War II Iraq. It is described as a “classic love story featuring passion, jealousy and murder”. Tagged with Farida, Naim Kattan, Norman Cornett, RadioVM. 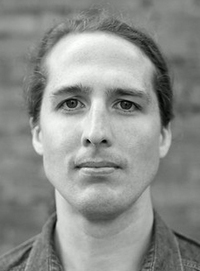 Congratulations to David Huebert, the winner of this year’s CBC Short Story Prize! David won this year’s short story competition with a story entitled “Enigma”, which is about a woman who must end the life of her beloved horse. As he explains in a recent article by David Burke, the idea for the story came from when his sister’s horse died this fall. David’s story reflects the grief and emotions that his sister encountered, as he states, “I was trying to imagine what she was going through”. The prize includes $6,000 from the Canada Council for the Arts as well as a 10-day writing residency at the Banff Centre. David states “the residency at Banff might be even better for me than the money, because you know money can always get folded into everyday expenses”. David Huebert is originally from Halifax, but has lived in Revelstoke, Fernie, Victoria, and Toronto. He is currently a PhD student at Western University. 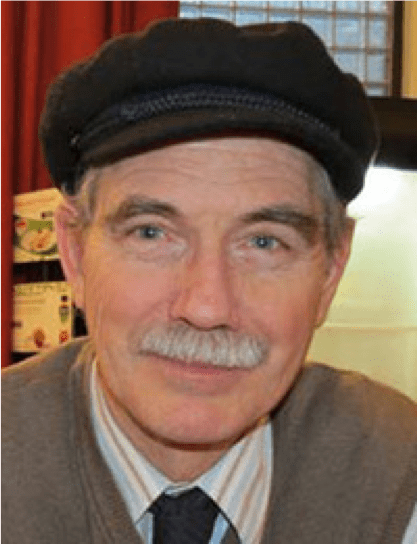 His poetry has appeared in journals Event, Vallum, The Antigonish Review, and The Literary Review of Canada, while his fiction has appeared in Grain, Existere, and The Dalhousie Review. David Huebert is also the author of We Are No Longer the Smart Kids in Class, a collection of poems released by Guernica last fall. Tagged with CBC Short Story Competition, David Huebert, Enigma, We are no longer the smart kids in class. Guernica author Elana Wolff recently gave an interview with The New Quarterly about the inspiration behind her essay, “Paging Kafka’s Elegist”, which is this year’s winner of the Edna Staebler Personal Essay Contest. Susan Scott introduces the interview by stating “I describe the first-place essays as a gift. I say this less because our eclectic judges see the winners as stand-outs and more because of what such works embody – a voice, a drive, an excursion to a place we think we know”. She goes on to state, “discovery…is the genius of Elana Wolff”. Elana gives the backstory behind the essay, stating “the essay started percolating in January of 2015, as a continuation of the Kafka-Langer project and the quest for ‘Kafka’s Elegist’ Georg Mordechai Langer”. This quest involved tracking down the apartment in Tel Aviv where Langer had lived for the last years of his life, during which time Elana’s book A Hunger Artist and Other Stories; Poems and Songs of Love received a second printing. Elana also explains that her choice to write an essay has to do with how she was “looking at the lives and work of real people, seeking to assemble a true picture of what was and what happened from pieces of extant yet disparate, sometimes obscured, writing. A poem, even a suite of poems, could not contain the investigative threads. And investigation is not the work of poetry, nor is it the work of fiction. Fiction is fabrication”. Besides naming other essayists that inspire her, Elana also describes the thorough revisions her essay went through, as well as a few other prose pieces on Kafka that she has written recently. These include “Kafka’s Death House”, which is published on The Writer’s Drawer, and “Trying to Find the Man in the Hat”. Elana concludes the interview by stating, “the prize money is going toward a trip to Prague this November. David and I will be staying in the building that housed the Worker’s Accident Insurance Institute, where Kafka served for most of his working life as an insurance adjuster…The prize money is going toward new research, hopefully more writing”. 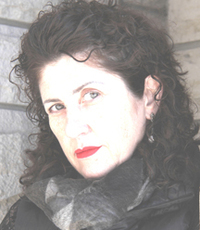 Elana Wolff is the author of A Hunger Artist and Other Stories; Poems and Songs of Love, a translation of writings by Franz Kafka and Georg Mordechai Langer. She has published four collections of poetry with Guernica Editions, including You Speak to Me in Trees, awarded the F.G. Bressani Prize for Poetry. She is also the author of Implicate Me, a collection of essays on contemporary poems, and co-editor with Julie Roorda of Poet to Poet: Poems written to poets and the stories that inspired them. A bilingual edition of her selected poems, Helleborus & Alchémille (Éditions du Noroît), was awarded the 2014 John Glassco Prize for Translation (translator: Stéphanie Roesler). Elana has taught English for Academic Purposes at York University in Toronto and at The Hebrew University in Jerusalem. She currently divides her professional time between writing, editing, and designing and facilitating therapeutic community art courses. Posted in Awards, Contests, Fiction, Interviews, News. Tagged with Elana Wolff, Susan Scott, The New Quarterly. We recently sat down with F. G. Paci to chat about his new collection of short stories, Talk About God and Other Stories, which will be released by Guernica this spring. GE: Could you tell us about your new book, and about some of the stories in the collection? 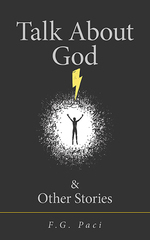 FGP: TALK ABOUT GOD and Other Stories is a collection of short stories that are at once thought-provoking and whimsical, informative and absurd. “Reading Boot Camp” is about recruits going through tough training exercise to become an elite cadre of readers to wage war against the Internet Culture. In “Talk About God” an atheistic teacher has a near-death experience that makes him re-evaluate his life. In “Rousseau’s Children” an academic abandons his kids and meets them again as adults. “Chef For All Reasons” is about a celebrity chef who uses his TV cooking show to re-connect with his family. “Philosophy For Idiots” is an actual question and answer course on ethics and epistemology. In “The Wager” a self-made billionaire tries to get people to buy into his methods of achieving of inner peace. GE: Tell us about some of the characters in your stories. FGP: The second story, “Talk about God,” is about two couples who have dinner together. One of these characters is a teacher at the local university of a small North Ontario city who has had a near-death experience. He’s a whimsical type who’s an atheist and into drama, specifically the works of de Sade, and likes to épater les bourgeois. His near-death experience, however, changes his outlook on things – and the other characters find out why. In “Rousseau’s Children” the main character is a modern academic who has sacrificed the normal life of a family in order to pursue his academic interests. The question for him is: Has he done the right thing? The story concerns how he meets his grown-up kids to find out his answer. In “Chef For All Reasons,” a renowned chef prepares a meal for his family on his own TV cooking show. As a person who loves food, he’s dedicated not only to his family, however, but to the TV audience as well. He wants to teach them about good food. This puts him at odds with the food industry, of course, which is not necessarily concerned with good food. And with his own son, who’s a teenager. His challenge is to make good food good-tasting food. GE: How did the book evolve during the writing process? FGP: The stories resolved themselves with their particular characters and situations, of course. The more I worked on them, however, the more they assumed a light-hearted tone in order to engage the reader. They turned out to be at once informative and amusing, provoking and entertaining, whimsical and serious. Most of them are easy to read, I’d say – and yet they deal with serious topics. GE: Would you say that there is a central thematic concern in your stories? FGP: My first collection of short stories, Playing to Win, has a definite thematic strain. Each story is about a sport or game which brings out character. In this collection, however, the stories are very different from each other. If there is a thematic overview, it would concern the art of teaching – whether it’s a drill sergeant instructing recruits in a boot camp, actual teachers in classrooms and in real-life situations, a chef preparing a meal on a TV cooking show, or a self-made billionaire offering people a channel to inner peace. GE: Do you have a writing routine or any specific writing rituals? FGP: I’ve been writing for a long time. I write every day. Same place. Early morning. No exceptions. Unless it’s an emergency. At one time I couldn’t write except long hand with a fountain pen. Now I work directly onto a computer. There is a ritual, yes, but everyone has their own way of getting into the zone. It’s a matter of slipping into an almost a trance-like state of mind, one in which the words come of their own accord. But that’s only for the first few drafts. Afterwards, of course, one has to slip in and out and try to keep one’s head and be rational and crafty and revise over and over until it feels right. One is never completely sure, however. GE: What, in your opinion, qualifies a great book over a good one? FGP: The great books, I suppose, are the ones that have withstood the test of time. The ones that were able to remain true to their time and place and yet transcend the factual world of time and place and speak to all time and place. The books that can change one’s perspective and even one’s life. The Iliad. The Upanishads. The Tao Te Ching. The Bible. The works of Plato. Of Nietzsche. Etc. If you mean the great novels, that’s another story. But most people know what they are. GE: Have you been working on anything recently? If so, what can we expect? FGP: I have another collection of short stories, some of which cross over the line between the real and the absurdly real. I also have a novel about high-school teachers and one in particular who develops an obsession with the Bible. F.G. Paci was born in Italy and grew up in Sault Ste. Marie, Ontario. He was the Elia Chair writer-in-residence at York University and has an honorary degree from Laurentian University. 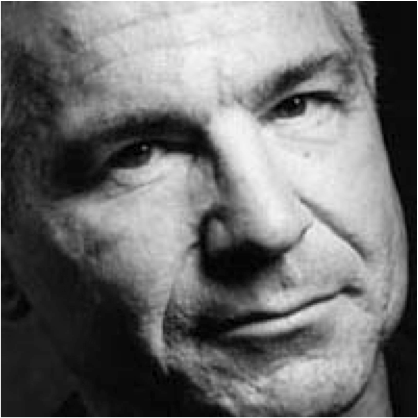 He is the author of 13 novels, the last of which was The Son (Oberon, 2011). 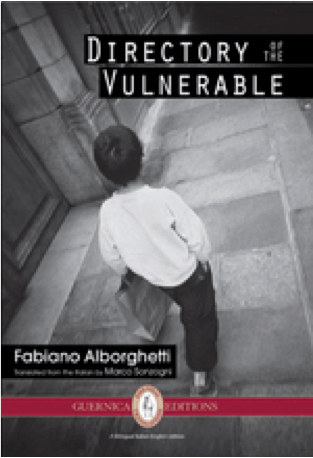 Among the novels he has published with Guernica are: Italian Shoes (2002), Hard Edge (2006), and Peace Tower (2009). His first collection of short stories, Playing To Win (Guernica), came out in 2012. He lives in Toronto with his wife and has one son. Tagged with F.G. Paci, Interview, Talk About God & Other Stories. 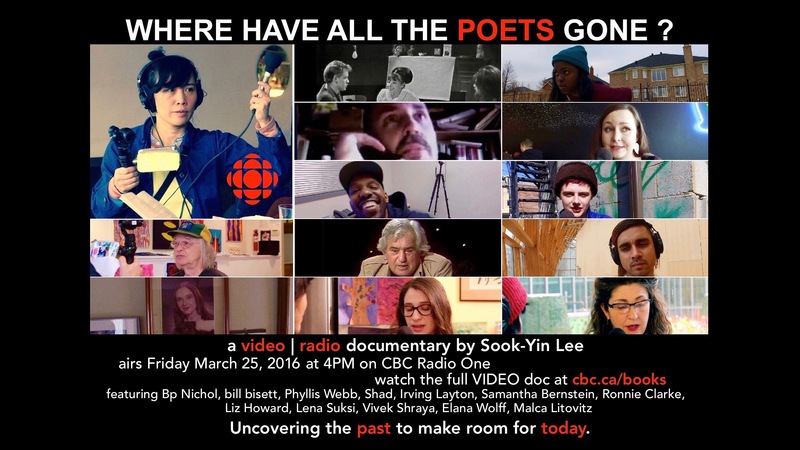 “Where Have All the Poets Gone?” Documentary Featuring Elana Wolff and Malca Litovitz! Sook-Yin Lee searches for a reclusive eighty-eight year old poet and ground-breaking CBC broadcaster. Uncovering the mystery leads her to question Can-Lit cultural myths and turn her attention to a new generation of Canadian poets writing a different path. Sook-Yin Lee states the following about Where Have All the Poets Gone? : “in a climate where you can’t make a living as a poet and you’re lucky to get a publisher, poetry thrives. I set out to find a new generation of working Canadian poets whose expression reflects their struggles and convictions”. Some of the poets featured in the documentary include BpNichol, bill bissett, Phyllis Webb, Stephen Collis, Shad, Irving Layton, Samantha Bernstein, Ronnie Clarke, Liz Howard, Vivek Shraya, Lena Suksi, and Guernica’s own Elana Wolff and Malca Litovitz! Elana Wolff has published four collections of poetry with Guernica Editions, including You Speak to Me in Trees which was awarded the F.G. Bressani Prize for Poetry. She is also the author of Implicate Me, a collection of essays on contemporary poems, and co-editor with Julie Roorda of Poet to Poet: Poems written to poets and the stories that inspired them. A bilingual edition of her selected poems, Helleborus & Alchémille (Éditions du Noroît), was awarded the 2014 John Glassco Prize for Translation (translator: Stéphanie Roesler). Malca Litovitz was a full-time teacher of English literature and creative writing for 25 years, in addition to being an editor, critic, performer, mentor, and award-winning poet. She was the author of At the Moonbeam Café and To Light, To Water, which won the 2000 Jewish National Book Award. Click here to watch the trailer for Where Have All the Poets Gone? and here to read a CBC blurb about the documentary. Be sure to check out the CBC website by clicking here on March 25th to watch the whole film, and by clicking here to listen to the radio version! Tagged with Elana Wolff, Malca Litovitz, Sook-Yin Lee, Where Have All the Poets Gone?. Comments Off on “Where Have All the Poets Gone?” Documentary Featuring Elana Wolff and Malca Litovitz! We recently sat down with Pratap Reddy to chat about his new collection of short stories, Weather Permitting & Other Stories, which will be released by Guernica this spring. GE: Pratap Reddy, please tell us about your new book. PR: Weather Permitting & Other Stories is my first book. It’s a collection of short stories. Most of these stories, in fact, all of them, revolve around the immigrant experience. I came to Canada as an immigrant a little over ten years ago, so I have inserted a lot of my own experiences into these stories. Using different characters of course— it’s not autobiographical. I have many fictional characters around whom I have woven these experiences of being new to Canada. GE: Would you say that there is a thematic question which the stories in your book focus on? PR: The stories focus on the immigrant experience, in particular the experience of new immigrants. They are coming from different cultures, different countries, different continents. Most of the characters are from India. They have this set of expectations from the first moment they land, and then they find that there are many unexpected problems and many challenges. No doubt there are many heartwarming things that happen to them too. Notwithstanding that, they face the difficulties of finding the right kind of jobs, their past experience not being taken into account, and their educational qualifications not being given due weightage. So as new immigrants they face a different kind of challenge than immigrants who have been here for some time, who are accustomed to being in Canada, a bit jaded. GE: How did this question first occur to you? PR: It’s like this— many of us want to be writers. Perhaps it goes back to the time when, as a child, I enjoyed reading books and somehow thought that I should become a writer. Never mind that nowadays writing is not a very paying profession, but there is this desire. Once I came to Canada as a new immigrant, the challenges I faced gave me a kind of stimulus to think about writing. I then put these down in fictional form, so to speak. GE: Did the book change significantly from when you first started writing it to the final version? PR: Pretty much, I should say, because when I first came I would write as we write English in India. So publications of Indian origin in Canada picked up my stories for publication, but not other magazines. But I had the good fortune of my manuscript winning a Diaspora Dialogues contest, where the prize was a mentoring program. My stories improved with the mentoring. When Guernica acquired my book, the editor’s suggestions were also very useful, and I got a grip on the kind of stories that are suited to a Canadian marketplace. GE: How long did the project take, from start to finish? PR: Since I came here ten years ago— from the very first day I started to think about writing. I wrote my first short story within the next couple of months. The stories in Weather Permitting & Other Stories center around new immigrants— spirited people prepared to leave their home and hearth to travel to distant lands in pursuit of dreams of a better life. But often times there’s a reality check, and they are left to grapple with unexpected challenges: cultural shock, lack of Canadian work experience and jobs, absence of affordable daycare, and non-recognition of their educational credentials. Despite this, the stories show the determination of these immigrants to survive on alien soil. 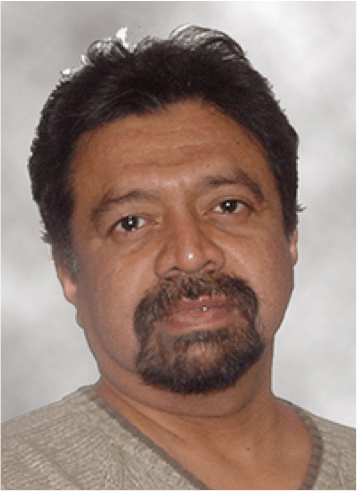 Pratap Reddy moved to Canada from India in 2002. 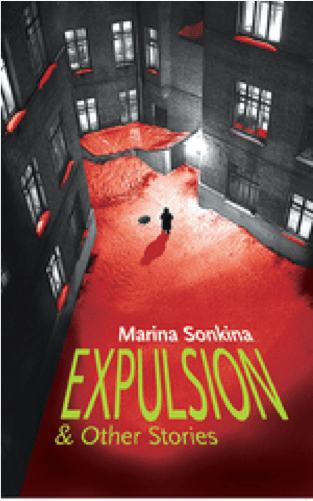 An underwriter by day and a writer by night, he writes about the angst and the agonies (on occasion the ecstasies) of newly arrived immigrants. His stories have been published in Canada, India, and the USA. Weather Permitting & Other Stories is his first collection. He is working on a second volume of short fiction, and a novel. He lives in Mississauga with his wife and son. Tagged with Interview, Pratap Reddy, Weather Permitting & Other Stories. We’re excited to announce the trailer for Steve Meagher’s Navy Blue! Broken hymns. Desperate prayers. Tales of first heroes. Stories of the street. 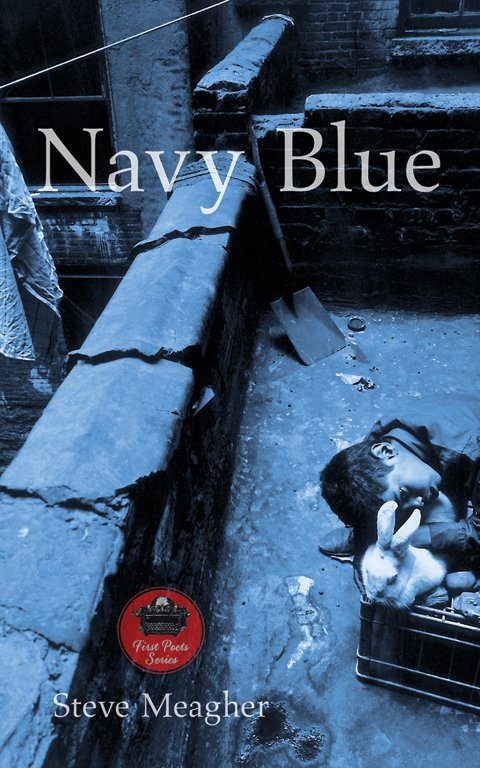 The poems in Navy Blue walk the middle ground between sorrow and salvation, tackling themes of devotion, regret, innocence lost and mortality through an array of dark landscapes and narratives of the dispossessed. Written in sharp and urgent language with undercurrents of raw emotion, this book marks the arrival of a brave and original new voice in Canadian poetry. Steve Meagher grew up in Oakville, Ontario. His poems have appeared in Carousel, The Nashwaak Review and Ottawa Arts Review. Navy Blue is his first book. He lives in Toronto. Click here to view the trailer for this wonderful collection of poetry! Tagged with book trailers, First Poets Series, Navy Blue, Steve Meagher.